1971: The final episode of A World Apart. 1990: General Hospital's P.K. Sinclair was really Cesar Faison. 1999: The final episode of Another World. 2010: The funeral of Alice Horton on Days of our Lives. Thanks to Jeff for sending in the item above. 1968: Humbert Allen Astredo debuted as Nicholas Blair in Dark Shadows. 1971: ABC aired the final epsiode of daytime soap opera A World Apart, starring Susan Sarandon. The show, created by Irna Phillips' daughter, Katherine Phillips, ran for 15 months. 1971: On The Doctors, the staff at Hope Memorial tried to keep Mike Powers alive. 1976: On Another World, Russ (David Bailey) and Sharlene (Laurie Heineman) assured Emma (Tresa Hughes) they would keep an eye on Molly. As Emma left she said, "I won't be that far away. If Willis starts anything, I'll come back and put a stop to it once and for all." This was Tresa Hughes last appearance as Emma, a character originally played by Beverlee McKinsey before she took on the role of Iris. The character of Emma returned in 1990 played by Elizabeth Ashley. 1990: On General Hospital, Robert told Frisco that P.K. Sinclair was actually Cesar Faison. 1993: On All My Children, Dixie (Cady McClain) dealt with Tad and Ted (Michael E.Knight) drama. 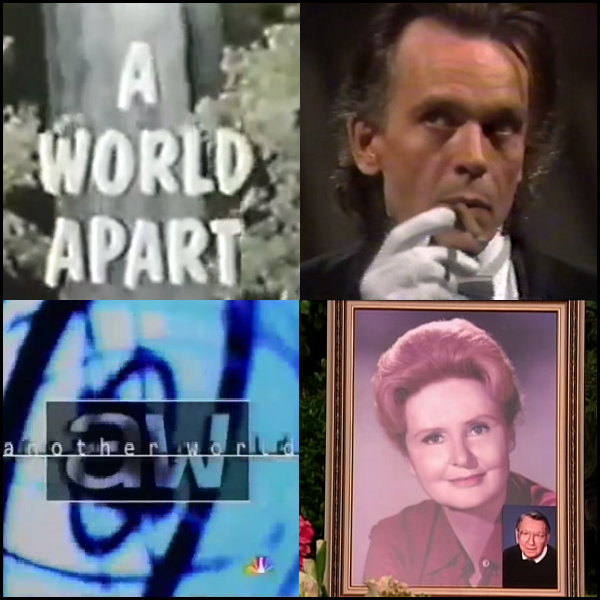 1999: NBC aired the final episode of Another World after 35 years on the air. 2001: On The Young and the Restless, Jill (Jess Walton) and Brittany decided J.T. was the best way to break up Mac and Billy. 2010: On Days of our Lives, family and friends said goodbye at the funeral of Alice Horton (Frances Reid).